Applying the 10 components of a Thinking Environment has been transforming meetings in companies for 2 decades. It is the future of how we can work together. Using the same principles in our teaching practice fuels this move towards improving the quality of everyone’s thinking – and learning. 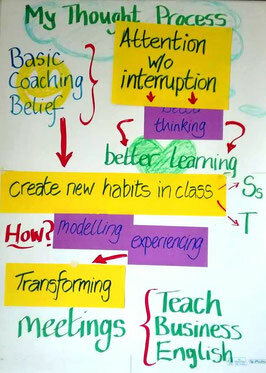 This talk introduced the principles behind Transforming Meetings and discussed how we can teach them to our learners. You can access Emily Havers' MA research paper via the Time to Think website. It's a short version and highly readable. The one page summary - How meetings in a Thinking Environment impact organisational life - I shared in the talk you can download here. Go here to read about The Thinking Environment. You can get hold of Nancy Kline's Time to Think on her website - also in German!. 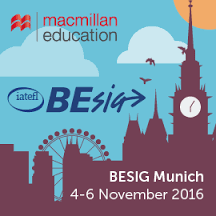 IATEFL BESIG 2016: What if nobody interrupted in meetings? A lesson to teach how meetings can be done differently. And a lesson to encourage a change in classroom habits - no more interrupting: attention generates better thinking which enables better learning.